No visit to New York City is complete without a trip to the one of the most iconic landmarks in the world, the Statue of Liberty. The Statue of Liberty National Monument welcomes thousands of visitors daily, with your ticket including access to Liberty Island, Ellis Island and a round-trip Boat Cruise on the Hudson River. The entire visit to the Statue of Liberty should take approximately 2-4 hours and will mainly depend on security line wait times and whether you plan on visiting both the Statue of Liberty and Ellis Island. I would recommend arriving early to avoid peak times and allow enough time to pass through security. Wait times to board any ferry can be over 90 minutes during peak months (April - September) and holidays, so be sure to plan ahead for your trip. Statue Cruises offers departures throughout the day from both New York and New Jersey. Access to the Statue of Liberty on the New York side is from Battery Park and from the New Jersey side from Liberty State Park. The box office, located inside Castle Clinton National Monument, is open daily from 7:45 AM to 4:30 PM and closed on Christmas Day. Boats depart every 30-45 minutes, with the first boat departing at 8:30 AM from Memorial Day weekend through Columbus Day and departing at 9:30 AM the rest of the year. You can check the daily ferry schedule here. Statue Cruises is the official ferry service provider and tickets can be bought online at their website. All visitors must purchase a ticket for ferry transportation to the parks which include access to both Liberty Island and Ellis Island. 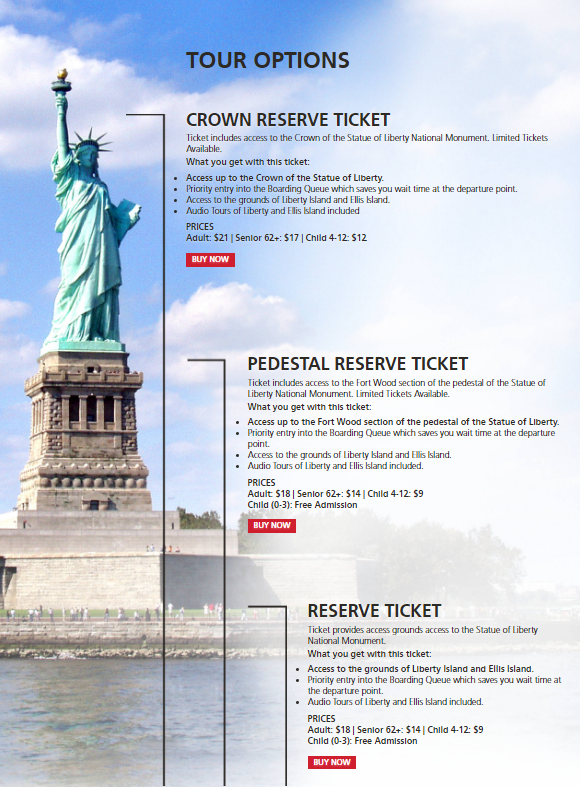 A standard reserve access ticket (includes boat cruise and Ellis Island) bought from the Statue Cruises website will cost you $18 (Adults), $9 (Kids), or $14 (Seniors). Note that kids 4 and under are free. Access to the Pedestal Reserve or Crown Reserve will cost you extra and tickets are limited. If you're planning on visiting multiple attractions in New York City, then I'd recommend buying a pass that includes multiple attractions that will help save money on all of the places you'll be visiting during your visit to New York City. If you purchased a pass, you will need to present it at the ticket box office for exchange tickets. Examples of some popular multi-attraction passes include the New York CityPass or the New York City Explorer Pass. I plan on highlighting the differences between these options for New York City in a future post and seeing if it makes sense to buy a pass or purchase each attraction ticket individually.